We've joked that we're going to embark on a dining tour of local college campuses, but we're starting to think that we should actually do just that. Students enjoy healthy food options at the newly-renovated Indian Quad Dining Hall, including locally-grown fruits, vegetables and grass-fed beef. Students are also encouraged to create their own meals, interact with staff to produce personalized meals and enjoy meals prepared in exhibition cooking displays. It sounds like eating on the set of a Food Network show. According to UAlbany's Facebook page, all of the school's dining halls are also now "trayless" -- which is apparently all the rage on eco-conscious campuses these days. 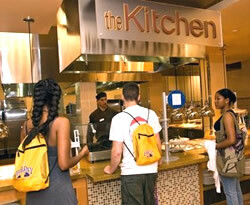 Trayless cafeterias reportedly reduce food waste and save water and energy. At least they renovated that place. Their dining halls used to be reminiscent of a prison cafeteria. And the food was bad. Really bad. Where was this when I lived on Indian Quad? Only a few years ago did the staff think vegetarians ate only spaghetti and vegans ate only iceberg salads. Trayless wouldn't have flown in my days there; you needed the tray to carry the plate with three grilled cheese sandwiches (I never could figure out how the could all consistently have one crisp side and one soggy side), the plate with a slice of pizza or two, another plate for your waffle, and the two bowls of cereal - often the most palatable options for your meal. I really don't get this trayless thing. When I go to a counter service restaurant and there are no trays, I end up making several trips back and forth to the table. This seems like a nightmare in a large cafeteria. Maybe the cups and plates are bigger than when I was in college. I remember most of us had three of those small glasses on our tray every day to make up one serving of water, milk, or whatever. And this is in an all-women's college. I can't even imagine how much food big 20 year old men eat at a meal.